Winners of the gift cards have been notified by email with instructions on claiming their prize. 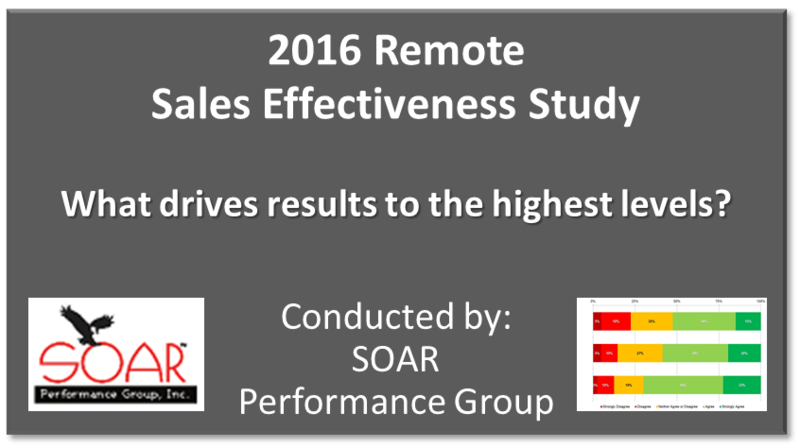 SOAR Performance Group invites you to participate in our Remote Sales Effectiveness Study. This survey studies the trends of remote sales professionals and their managers to spotlight best practices that result in increased performance. The right amount and types of communication, feedback and coaching to drive results. Benchmarks by industry, company size and route to customer. Relationships and patterns among the differing degrees of remote. Sales executives and managers whose direct reports spend at least five days per month working outside the office. Front-line salespeople that spend at least five days per month outside the office. Be entered in a drawing to receive one of ten (10) $25 Amazon gift cards. Receive a summary report of the research results after the survey is completed. Your survey responses will remain completely confidential and your name will not be given or sold to any external parties. Your email will only be used to deliver your research summary results and to enter you in the drawing. Thank you in advance for your help with this important research! We hope that you will find the results useful and relevant in your organization!